42" Tow behind lawn sweeper. 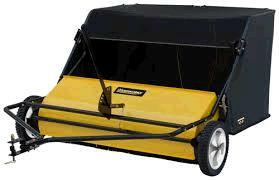 Sweeps/collects dry leaves and light grass clippings. Large 20 cu ft hopper is easily dumped on the move. * Please call us with any questions about our lawn sweeper 42 inch towable rentals in Oak Grove MO, Blue Springs MO, Independence MO, Lexington MO, Odessa MO, Independence MO and Western Missouri.